As I arrive in the basement of Belfast's McHugh's Bar, notepad and camera intact, the Glenariffe musician is nearing the end of a successful May-June tour of the UK, which took her as far as Milton Keynes, Eastbourne, London and a glowing appraisal of her "beautiful, beautiful voice" (if I and many here may say so ourselves!) from none other than Gaby Roslin. But not everything is hunky dory. Word had gotten out before the penultimate gig of the tour that it was sold out – and it isn't! Yet, in an atmosphere as tranquil and light-hearted as that in this basement, it doesn't matter. Much. Musically, St John and her support acts may offer no outright surprises – their inspirations are from a know-what-you’ll-get catalogue of pop, folk, country, jazz, blues and soul – but all three endear with soothing, sprightly vibrancy. Consider the evening a familiar recipe of melodious ingredients reinvented as an all new, mildly spicy casserole. First on the podium is James Bradley. The retail manager-turned-tunesmith efficiently wins over the modestly-sized crowd with earnest compositions and experimental covers. Putting Massive Attack in a Guns 'N' Roses sandwich – in other words, mixing "Sweet Child Of Mine" with "Teardrop" – contradicts logic on paper but flows like a train in this venue and with this audience. Were you to grade Bradley, I suppose you could give him three A's – for being amiable, agreeable and (slightly) abstract. Next, the mellow, merry Ciara O'Neill. Like a low-key nightingale, her sweet, intoxicating tones envelop you in a gentle hug and her humble banter elevates your spirit. Tonight she challenges both voice and mind, her literary influences (namely Sylvia Plath), Nashville experience and genuinely funny jokes shining in a radiant, heartfelt showing. If the tempo and pitch shift for "Arrow" comes across as a little too sharp and startling, that's a minor glitch. Similar shifts will await St John and her two Pauls, guitarist Paul Tierney and keyboardist Paul Davison, when they arrive, but a significantly longer set ensures a more adroit handling. Theirs is a multiple-song journey down the blues and soul highway with powerful pipes in a setting worthy of a jazz club. Comparisons to Dusty Springfield are warranted, but St John also emotes distinctly independent humility, channelled into her singing through her love of what she does and her gratefulness for a second chance after devastating personal setbacks. As Chumbawamba might say, she got knocked down, but she got up again – stylishly. We mainly hear tunes from her album Grow, with some earlier EP based tracks and a few covers sprinkled in. From the heart-rending Reach, to the relatable Grow to the energetic Show Me, to the incredibly catchy Right Now, this is a set that reeks of poignancy and energetic rejuvenation, relaying messages about looking for love, seizing the moment and knowing when to switch off and enjoy yourself - something we journalists could all take heed of! - as only she can. It's all very mirthful, and dare I say it, mildly magical - the audience even get to act as the rhythm section and a gospel choir. What impresses me most about St John is how she defies low-key expectations, gently adapts and understatedly entrances by acknowledging her inspirations but ultimately doing things her own way. Projection and personality as exceptional elevation for relatively modest tuneage. Yet this relative modesty is also St John's greatest strength. With her, you get no frills, no pomposity, just full on fun from a singer-songwriter who simply relishes the opportunity to have it. Again. 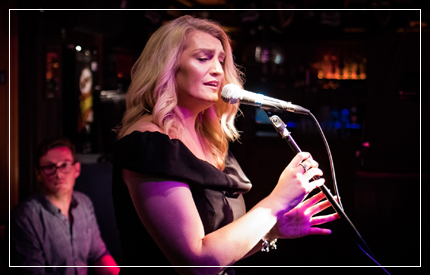 Amanda St John performed in the basement of McHugh's bar, Belfast, as part of a UK and Ireland tour in May and June 2017. For more go to amandastjohnmusic.co.uk. Photo: Simon Fallaha Photography.